Lower Savage on fire. Streamer fishing at it’s best yesterday. Chris and his pair of great rainbows. Trout snout fever. 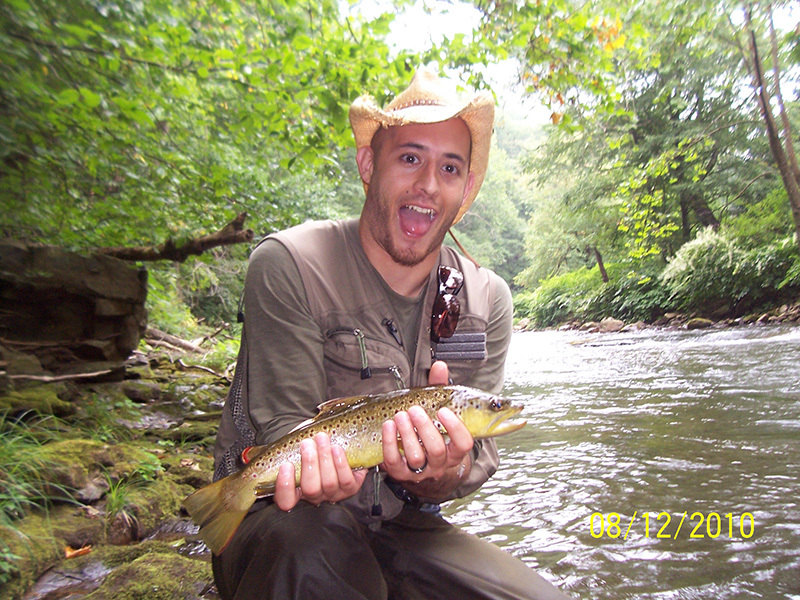 Fly fishing the North Branch Potomac and Savage River in western Maryland is stellar! Oh man. You missed it again. 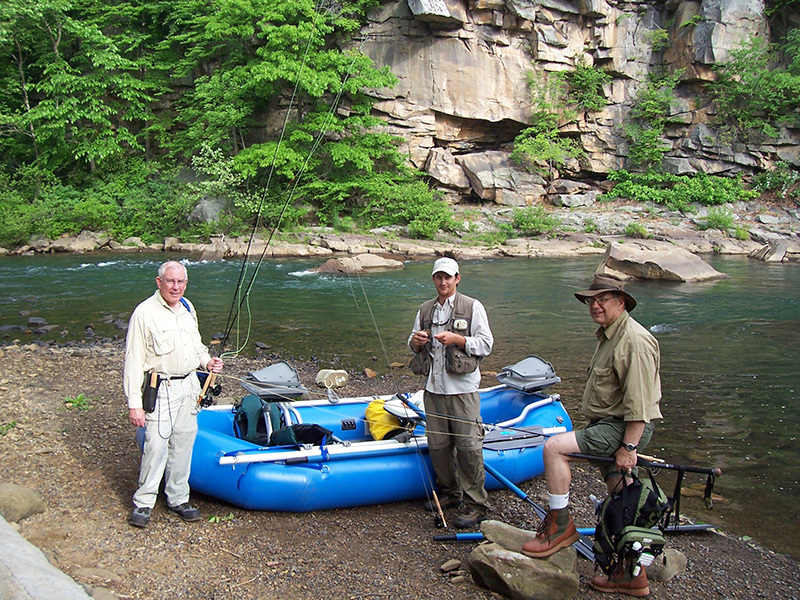 Yet another fully epic adventure floating the North Branch Potomac! One of the many fine dry fly rainbows from last night. 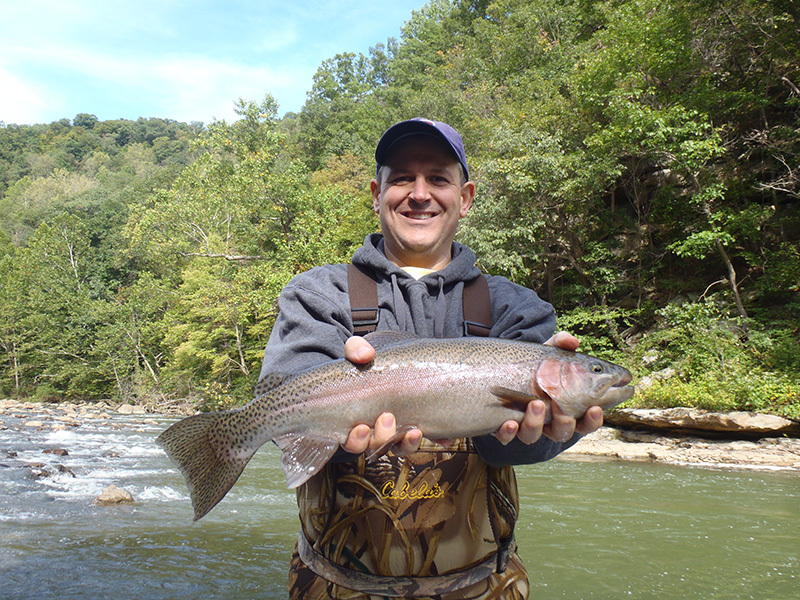 Smokin’ hot action again on the North Branch Potomac. 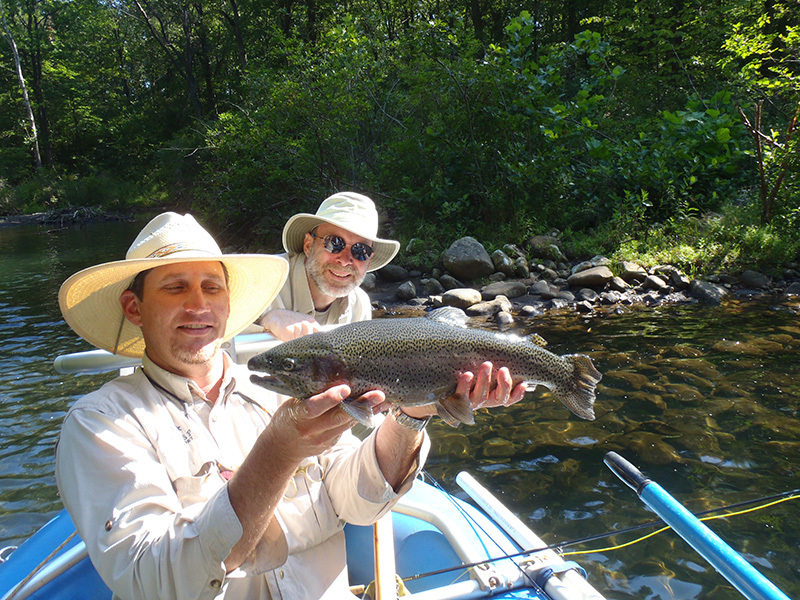 Rod Yassin the trout assasin strikes on his first ever float with Savage River Angler! Well, I keep waiting for it to slow down, but it just keeps staying good to excellent. The North Branch has been absolutely smoking hot this season. Aside from a few tough days, it’s been absolutely fantastic. 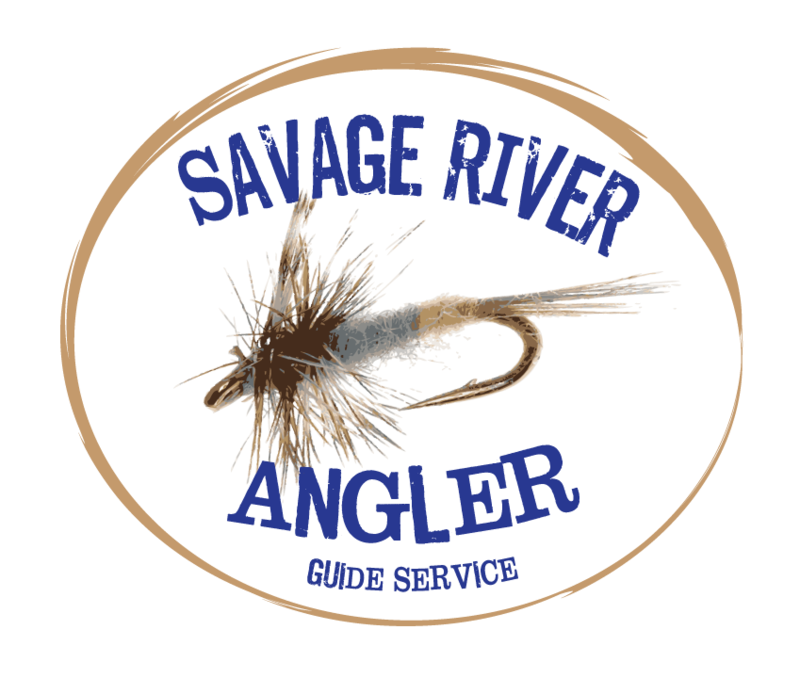 The Savage has been very good, but with all the young of the year in it, the bigger fish are harder to find this year unless anglers fish streamers most of the time. The NoBr on the other hand has been soooo very good to us. 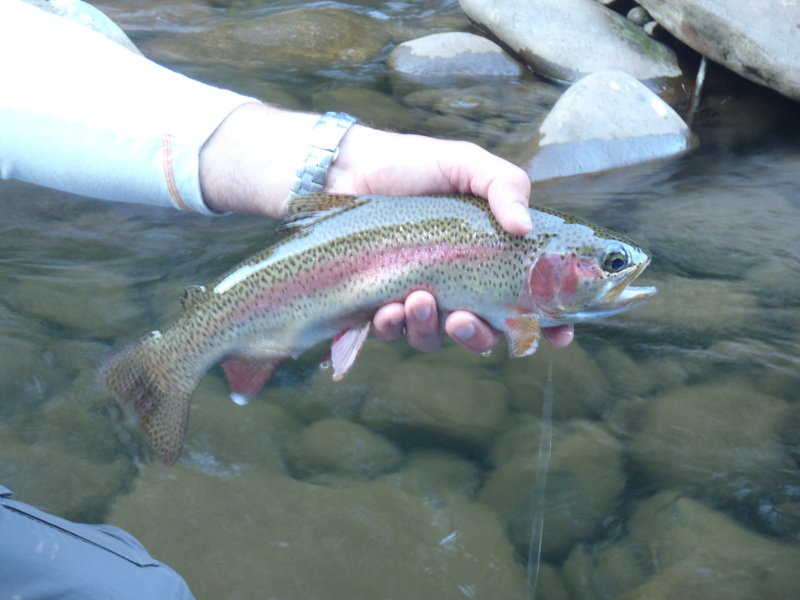 Rod struck smoothly and often on mainly wild rainbows yesterday. The three browns that he landed appeared to be wild and also came to the parachute adams, but otherwise, we netted around 21 rainbows, each and every one of them was wild. 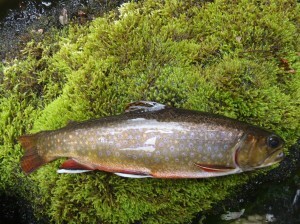 No brookies or cutts yesterday, but that was ok with me. Rod absolutely got dialed in after we ate dinner. He wrecked it. It was EPIC out there! Not to mention a blast to watch an angler go from fishing just ok, to absolutely tearing ‘em up. What a fun night. Here is one of the 15″ wild rainbows that Rod stuck on the way down. The North Branch and Savage Rivers are still smoking with great dry fly action. Garrett county is getting lots of rain, and the fly fishing is great! I had a chance to slip out a few night ago and hit Spot X on the North Branch of the Potomac after a wade trip yielded all small fish on the lower Savage. There was an ok slate drake hatch that got all the fish looking up and I took full advantage with my parachute adams. Don’t forget to click the gear icon and then select hd 1080 since I’m not savvy enough to figure out how to make it be hd when I post it. Anyhow, the fishing was special. The fish were absolutely smashing dries. Check it out. Then get in your car and get up here. 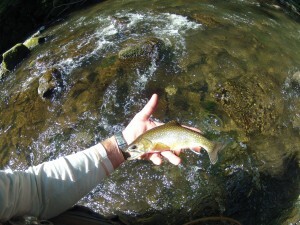 The float fishing is still great, and flows are optimum. Great dry fly action on the lower Savage last night. So, I had a full day wade on the lower Savage yesterday. We got in the water a little before 2 pm after waiting out a few storms. There wasn’t much bug activity, so we started “searching” with a caddis and parachute adams double dry rig. The trout were very quick to let us know that they would prefer the parachute adams. We then fished that adams with a zebra midge down. The fish stayed on the adams, refusing to acknowledge the midge. 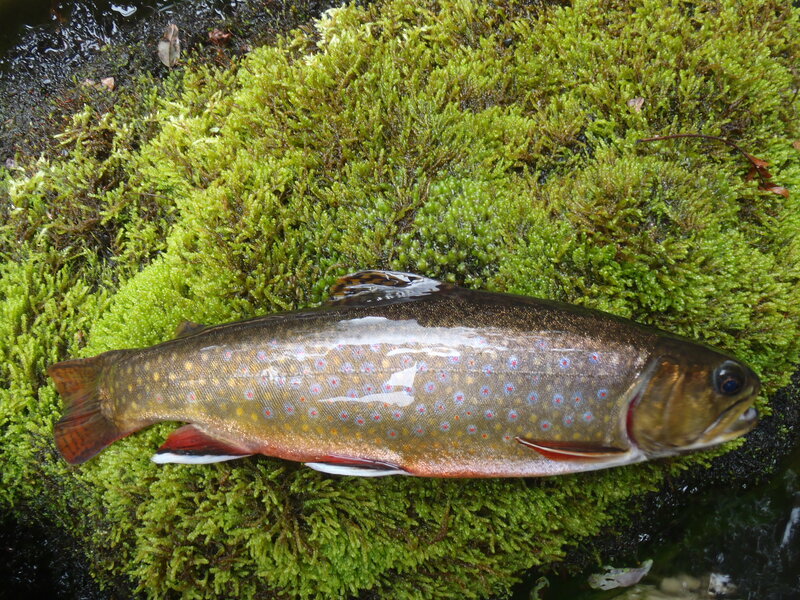 Lots of small brown and brook trout were fooled on the surface. 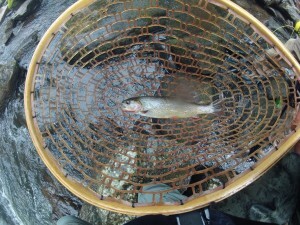 Jim also stuck one pretty cutthroat that had made the long journey upstream from the North Branch. The action slowed after dinner, so we switched it up and fished a cranefly dry and started moving good amounts of fish again until we couldn’t see the fly. Mission accomplished. North Branch Potomac is excellent again. 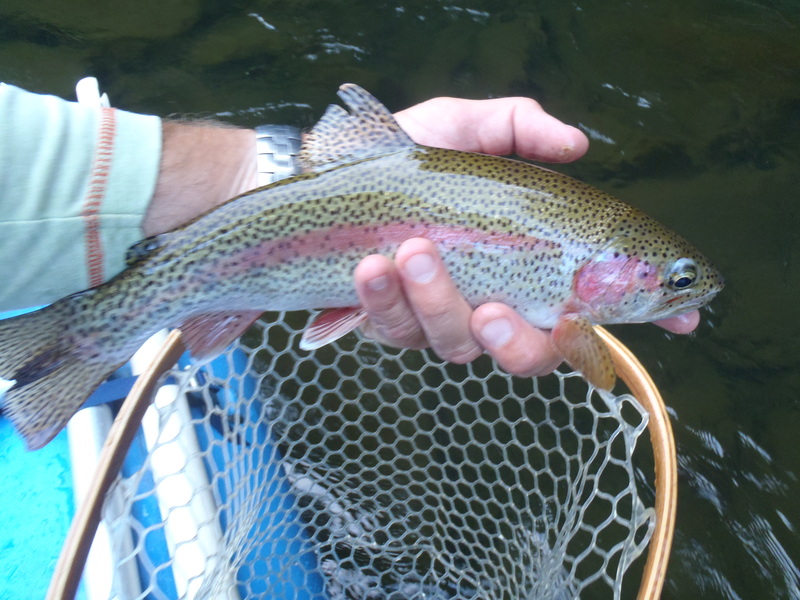 Wild rainbow snouts everywhere last night. Remember to click on the gear icon in the lower left corner when you start playing the video and then select HD 1080! We’ve been reporting mainly on the North Branch of the Potomac recently, but yesterday the lower Savage fished pretty well despite the heat and abundant sunshine. What a great place to escape the summer weather that has finally found it’s way to us. Good midge fishing was had in the pocket water yesterday, and a few larger fish were moved along with a lot of fingerlings, which has become a norm this year. A Griffiths gnat was the fly of choice. Come on up and beat the heat this week and get deep in the Savage or Potomac. Both are fishing well! 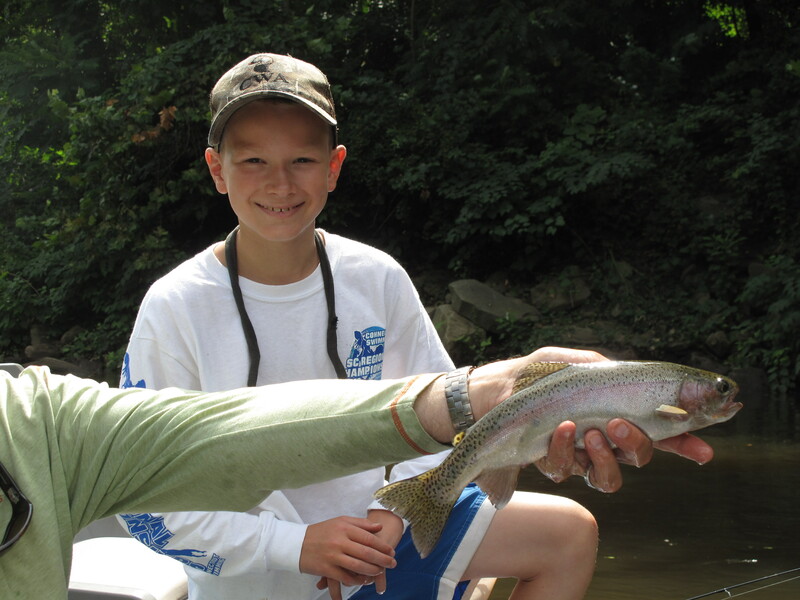 The fishing has remained very good on the North Branch of the Potomac and Savage Rivers. 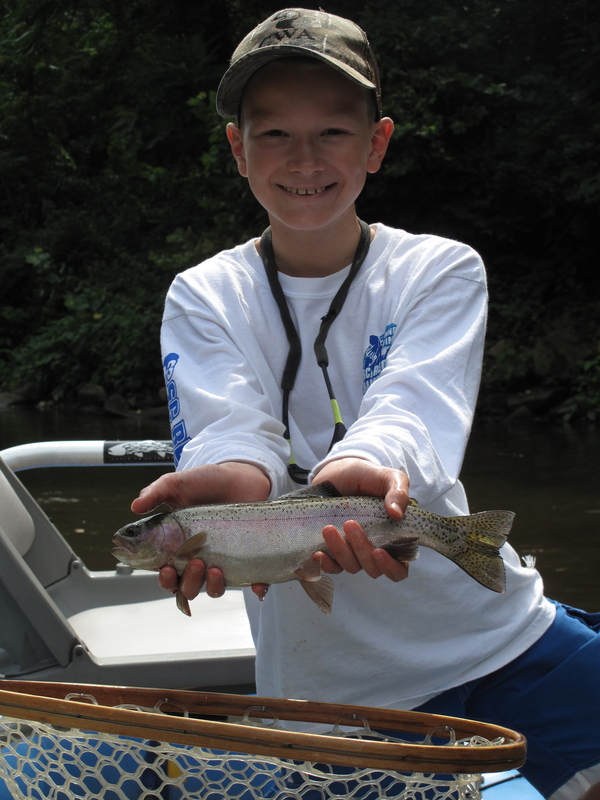 Even though it’s mid summer, the cloudy conditions and plentiful rain have kept the fishing much better than average. Recent wades on the Savage, although a touch on the full side, have been giving up some great dry fly fishing. There are an awful lot of smaller fish this year, which has resulted in good streamer fishing action as well. The North Branch of Potomac has also been giving up high yields. On my float last night, it was a typical slow start with the action picking up right on time around 5:30 pm. Most of the action was fishing on top with dry flies, while the nymphs mostly were ignored. “Spot X” provided a much anticipated flurry of rising fish as did most of the other fast water once things got going . While targeting the monster that broke a client off a few weeks back, Royce managed to move a bunch of solid wild rainbows fishing a large olive sculpzilla. 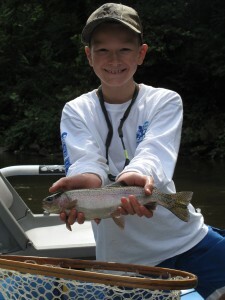 Get up to the Deep Creek Lake area and fish some of the other rivers and streams. Most of the flows are very good right now and temperatures are still nice and cool. The fishing is great. Come and enjoy it with us.